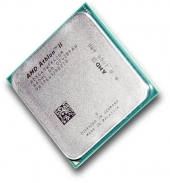 Much attention has been paid of late to AMD‘s new 6-core desktop CPU, the Phenom II X6 1090T. While its performance is certainly impressive, its price—over $300 at time of publication—can be off-putting to many system builders. For those whose wallets run a bit leaner these days, AMD has brought us the Athlon II X4 640. This quad-core CPU promises good performance at a low price. Let’s take a closer look, and see how it stacks up. As with all of AMD’s AM3 offerings, the X4 640 supports the fastest varieties of both DDR2 and DDR3 DRAM with its onboard memory controller. Which kind of RAM you use will be determined by the motherboard, as the two are deliberately not socket-compatible. With a 95W TDP, power consumption is firmly in the upper-middle end of AMD’s line, with only the new hexa-core Phenom II chips drawing more. Massive tower heatsinks or watercooling solutions are not needed with this CPU, but an aftermarket cooler will help greatly in keeping things cool. Anyone have the foggiest idea what this says?